Singapore, February 20, 2017 – Global engineering firm Meinhardt will be helping Abu Dhabi’s Department of Energy (DoE) and its sector companies build their water management capabilities, with the aim of establishing a World Class Water Capability Development Centre in the United Arab Emirates in the future. 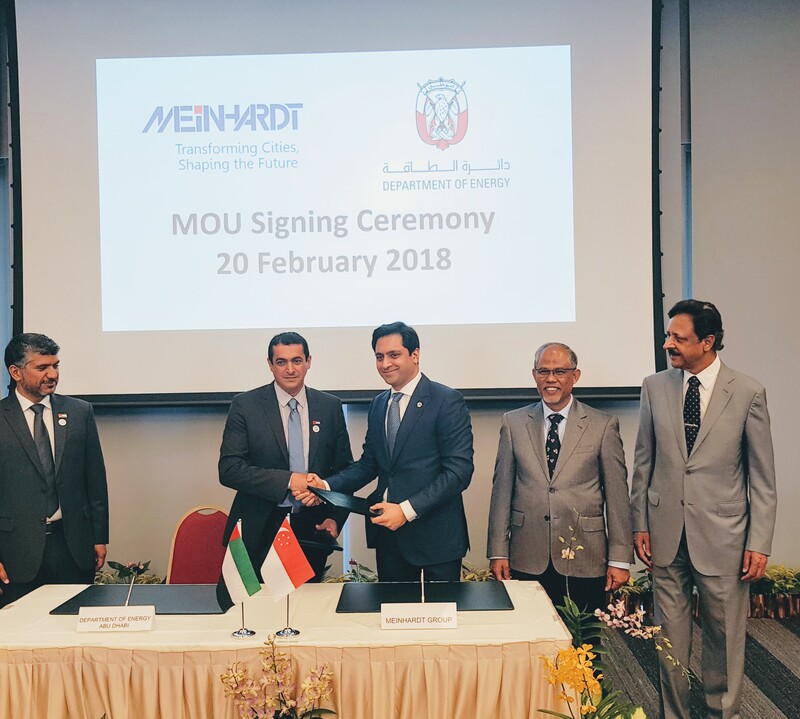 An MOU was signed today between both parties where Meinhardt and its partners will provide capability development training for DoE and its sector companies. Under the MOU, Meinhardt will equip DoE’s sector companies staff with various disciplines to enable them to operate and maintain water distribution systems, manage water network operations and control centres, automate distribution networks, manage treated water networks, maintain water quality as well as acquire understanding on latest desalination technologies. Meinhardt will also assist in conducting diagnostic assessment and audit of Water/Waste Water Network Management. Held at Singapore’s national water agency, PUB’s headquarters, the witnesses to the MOU were His Excellency, Engineer Awaidha Murshed Al Marar, Chairman of the Department of Energy and Dr Shahzad Nasim, Group Executive Chairman of Meinhardt. The ceremony was also attended by Singapore Minister for the Environment and Water Resources Masagos Zulkifli and His Excellency Engineer Mohammed bin Jarsh Al Falasi, Undersecretary of the Abu Dhabi’s Department of Energy as well the United Arab Emirates Ambassador to Singapore and senior officials of both sides. His Excellency Engineer Awaidha Murshed Al Marar, Chairman of DoE said: “ The energy sector is constantly evolving, transforming and experiencing the rapid pace of change it faces today the “New Normal”. The interaction between digital technologies and economic forces is catalysing the fast change. In line with our UAE Vision 2021, we are pleased to sign these MOUs to upskill and augment our sector employees to prepare them for the evolving industry landscape. This envisages creating a workforce empowered with critical technical skill development knowledge & capacity building”. Meinhardt is one of the most respected engineering companies in the world and the largest independent engineering consultancy in Asia. We work with clients from all over the world on diverse projects including tall buildings, water environment, roads and highways, aviation, metros and railways, ports and power. Spanning developers, financiers, construction companies, government agencies, multinational corporations and multilateral development banks, our customers from around the world can count on our 4,500-strong global team in 47 offices to deliver high quality projects. With our Australian heritage, global headquarters in Singapore and proven track record in Asia, the Middle East & Europe since the 1970’s, we blend the best of East and West in our thinking and management. We aspire to be the world’s preferred infrastructure and urban solutions partner. For more information, visit www.meinhardtgroup.com or follow us on Facebook and LinkedIN (@MeinhardtGroup). The Meinhardt Water Training Centre was set up in 2012 together with Nanyang Technological University/Nanyang Business School, to help drive professional competence in the water industry through hands-on training and attachments, and to create a networking platform for sharing of ideas and best practices. The curriculum consists of short courses tailored for operators, middle management and senior executives who are keen to broaden their knowledge and sharpen their technical, commercial and managerial skills in the areas of environmental, water and waste-water management. The courses are conducted by leading environmental practitioners from Meinhardt, top faculty from Nanyang Business School and experts from Singapore’s national water agency, PUB and a Singapore government agency promoting overseas growth of Singapore-based industries and international trade, International Enterprise (IE) Singapore.